AWR Cloud is evolving at a fast pace and even though we accompany each release with a presentation article highlighting the new functionalities we add, sometimes we realize it would be important to provide a more in-depth explanation of why we add that each functionality and how it can help you. Beyond functionality, each user is probably asking: so what is the benefit for me, how are my SEO efforts improved or supported by this new feature? Having been part of the development team of AWR Cloud from the beginning, I feel like I’m in a good position to give you the back story of why we choose to develop or add certain features, and what’s the reasoning behind these developments. So in this article I’m going to try to explain some of the new features we’ve been adding lately. Those of you who are AWR Cloud users have already noticed the changes we’ve made in the Visibility section – we’ve added two entirely new views called Search Engines and URLs. 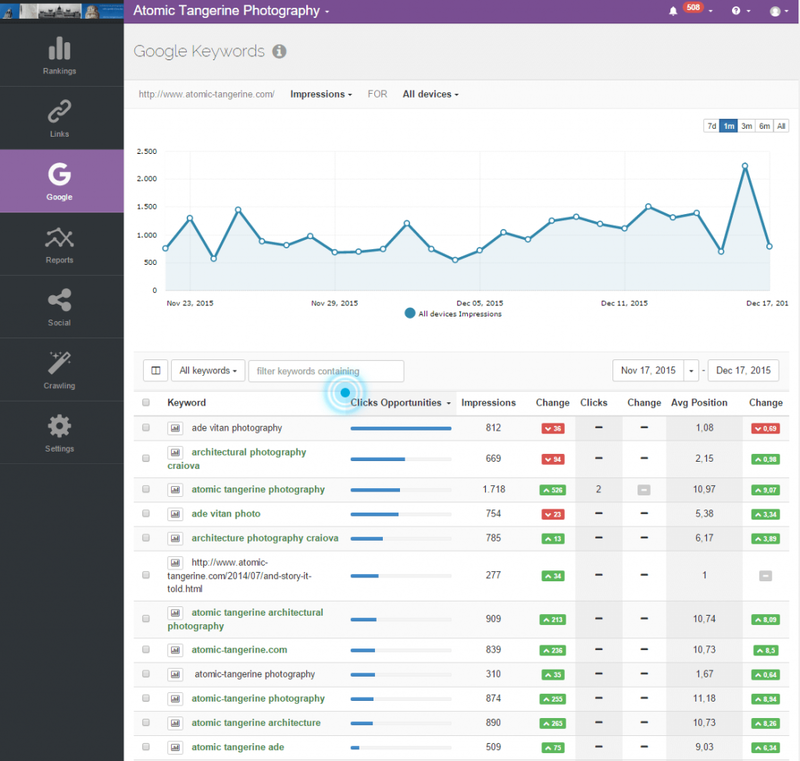 The Search Engines Visibility section was designed with a single website in mind and can help you compare your website’s visibility metrics for up to 6 search engines side by side. This view can help you compare your performance on, say, Google, Bing, and Yahoo, and see where your strengths and weaknesses are. But this view really shines when it comes to local businesses. If you own a chain of restaurants, or any kind of business that requires location-based rank tracking, you can actually see, side by side, which of your locations performs better and where you need to concentrate your efforts. For instance, it might have something to do with how you optimized that location for the search engine: a better description for Google My Business for instance, or higher quality photographs of the location, more client testimonials, and so on. 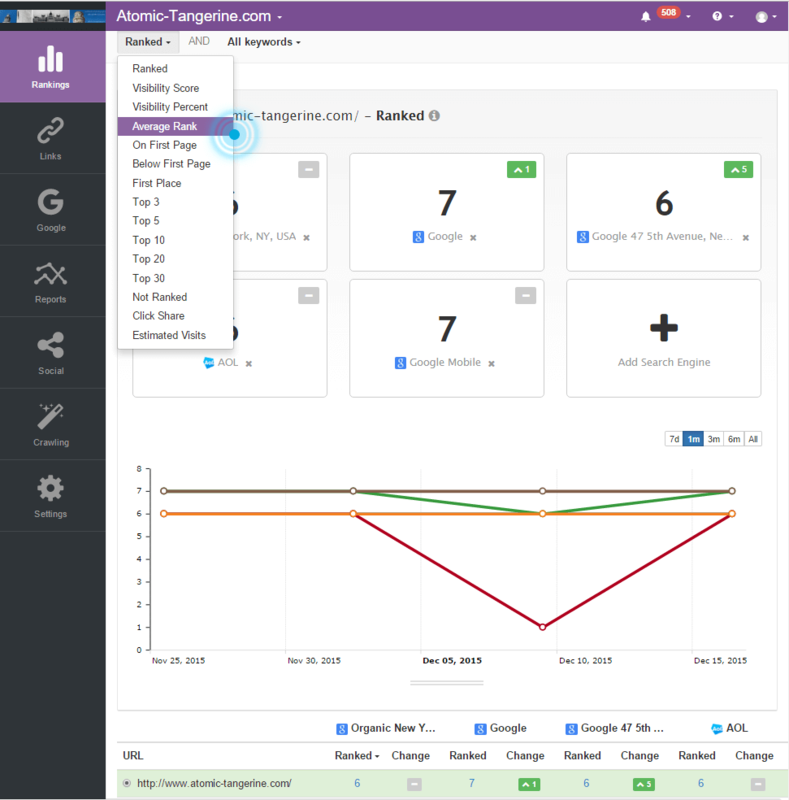 You can even use this feature to A/B test the optimization of your various business locations by playing with variables and seeing which performs better, and why. Or perhaps you might notice that a certain location had higher visibility because it offered a promotion, or hosted some special event. The other new view is the URLs Visibility. 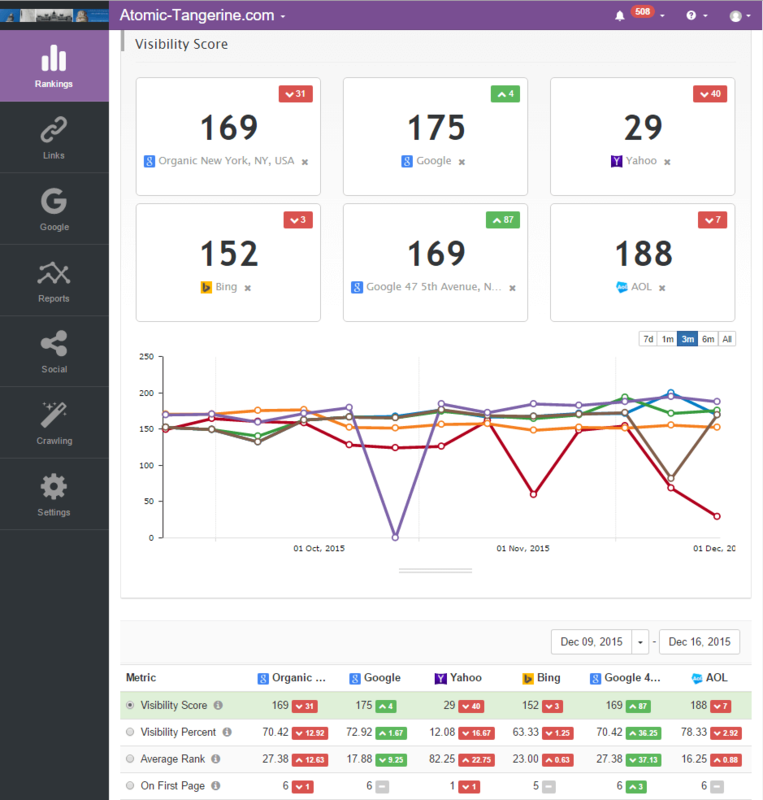 From now on you can track the visibility metrics for 30 URLs that have ranked for your website. This way you can see which of your pages need improvements and which of them rank the way you want them to. Now let’s focus on some of the more subtle, yet helpful changes in AWR Cloud. One of those is the Best Position feature, which has a pretty self-explanatory name, but whose benefit might not be obvious at a first glance. This value indicates the highest position ever achieved by a keyword or URL for your website, since the first update in AWR Cloud. This metric allows you to see how high a website has ranked for a certain keyword, giving you an idea of your evolution over time. If you notice the current position is not your best historical position, you know something has changed for the keyword or URL. Your best historical position so far is not necessarily the best position you could achieve, but you can choose to view it as a milestone to be surpassed. With a complete history of the changes made in the past, you might discover that some of those optimization tweaks for that page, or even the design itself (different banner, different form, different call to action), drove these variations in position. Similarly, those same change might have boosted the rankings, in which case you might try to recreate the process on other pages that could use improvements. Another subtle improvement is the Change column available in the Keyword Ranking and Website Ranking reports. We’ve split the former Position+Change column into two different columns, Position and Change. Why? Because we wanted to be able to sort by Change as well, not just Position. Indeed, now you can sort your rankings by how much they’ve changed over time. For instance, you might want to see how your website has moved in rankings over a certain period of time when you made significant changes to the website, such as a redesign, or during a campaign. More importantly, these metrics are great indicators of keywords that show a significant drop or climb in rankings, allowing you to act fast. However, please note that the sortable column only works for consecutive updates and only on updates that we’ve performed after the feature was released. The Google menu of AWR Cloud has some very insightful tools, and one of these is the Google Keywords section. Here you’ll be able to see all the GWT related metrics, as you’ve been able to for quite a while, except now we have added a new column that can actually make a huge difference when you’re looking for new keywords to track and improve your overall website rankings. This column is called Click Opportunities. The main idea behind this new metric is to show you how many clicks you lose on a keyword because of your low CTR value for that keyword. For instance, if your CTR is 20% but the average CTR for that position is 25%, you lose 5% of the possible visitors. One of the causes for this loss can be a vague meta description or title, which can easily be improved. Click Opportunities allows you to actually measure how your pages and website can be improved. How? By generating reports with the data you have now and data you’ll get in the future, you can measure and see whether any improvements you’ve made have actually changed this metric’s value for better or worse. More and more users are searching from their mobile devices. So in order to be competitive in the market, you need to adapt your website and move on with the trends. 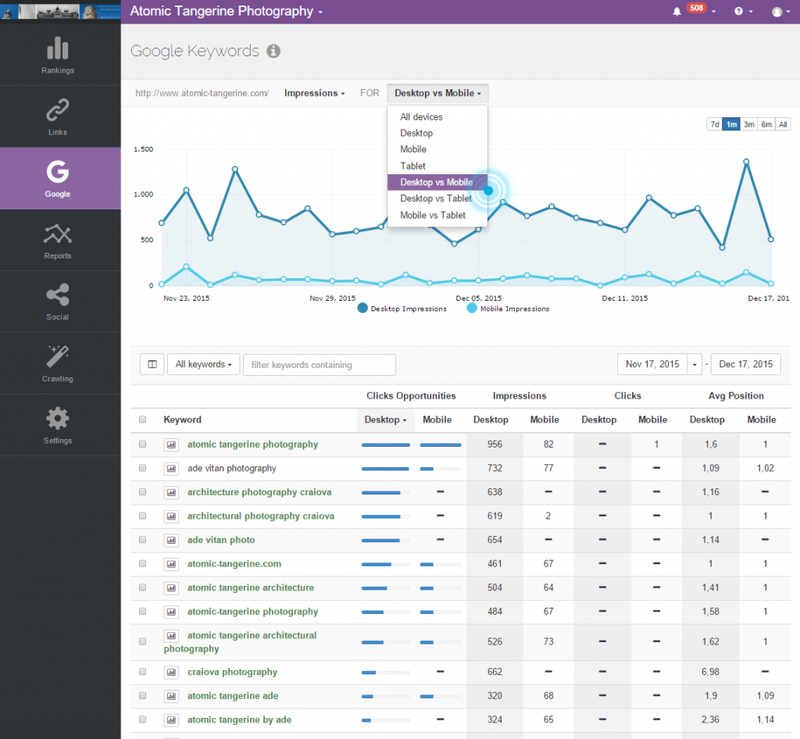 For that purpose, in the Google – Keywords view you are now able to see the GWT metrics by device as well. Many of you may be tracking mobile rankings, so this feature will definitely help you a lot. And if you’re already investing time and resources in a separate mobile marketing strategy, you know that there are other considerations, and that results look different on mobile. You can also see the GWT metrics compared by device side by side, so you can check how your top keywords for Desktop devices are doing on mobile and maybe focus your efforts to make your website more mobile friendly. Or maybe your conclusion will be to start delivering different content on mobile, targeting different, more mobile-oriented keywords. This is yet another interesting GWT-based view with great strategy implications. 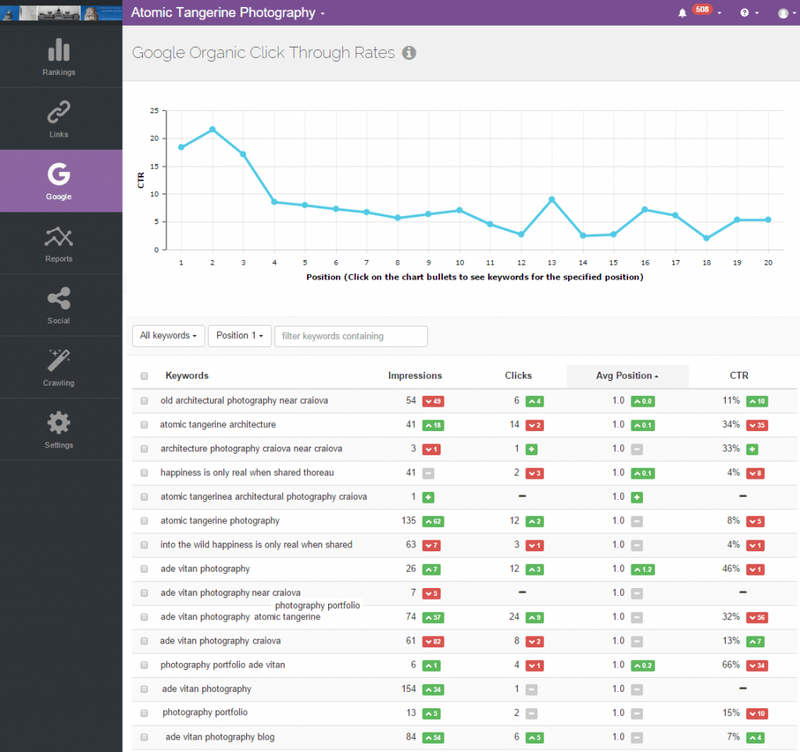 The chart in Google – Organic CTR shows your CTR curve over all the ranking positions for your GWT keywords, while the table view allows you to filter the keywords by their approximate average rank. 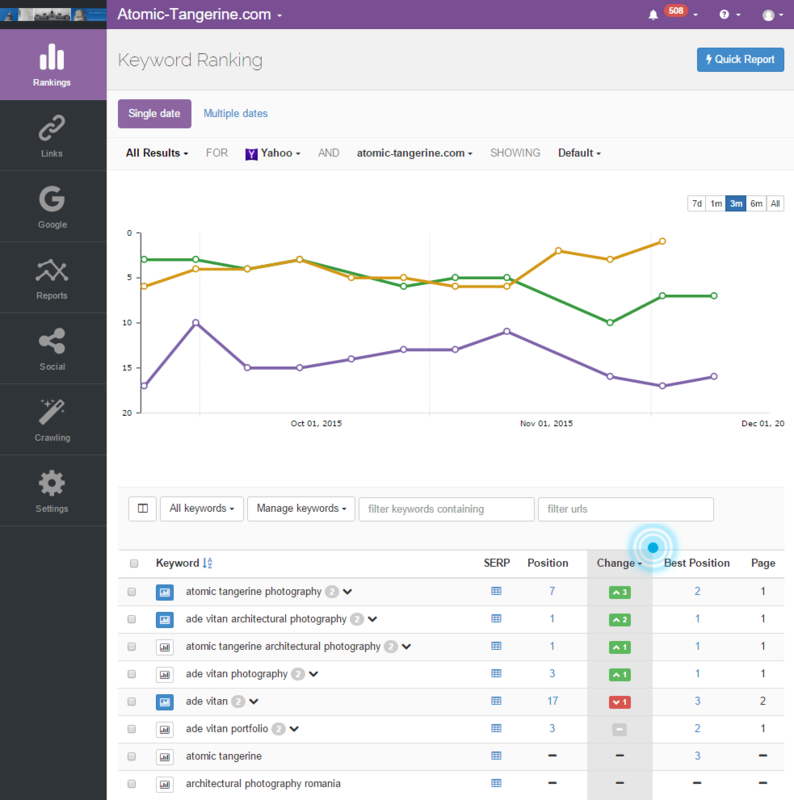 You can also choose to view only the keywords from your project separately, or only the GWT keywords. The latter can help you identify new keywords that you may want to track, but missed with your regular research methods, or maybe even ignored before. Why would you want to see you website’s CTR curve? Well, because the Organic CTR section will show you how many keywords you’ve got ranking on positions 1 through 20 (basically the first two SERPs), and the average click-through rate across top 20 positions. As we’ve seen from previous CTR studies, the first position always has much higher CTR values than other positions, so you should expect to see something similar in your data. To apply the data you find in this feature of AWR Cloud, it can be useful to take an in-depth look at each group of keywords based on their position and try to spot opportunities for improvement. For instance, it might look good to see you have a lot of keywords in the top position, but look at other metrics present in the report. Are the CTR values looking good? In case they are not, but you do see the potential in those keywords, you might want to start by optimizing for them. Compare Impressions with CTR – a high value on the first but very low on the second means you probably need to tweak optimization for that keyword. Look at the SERP – what’s different between you and the competition? Are their page titles more attractive? Do they have a better call to action? Try making changes for those keywords that really interest you and wait to see if the effect is positive. 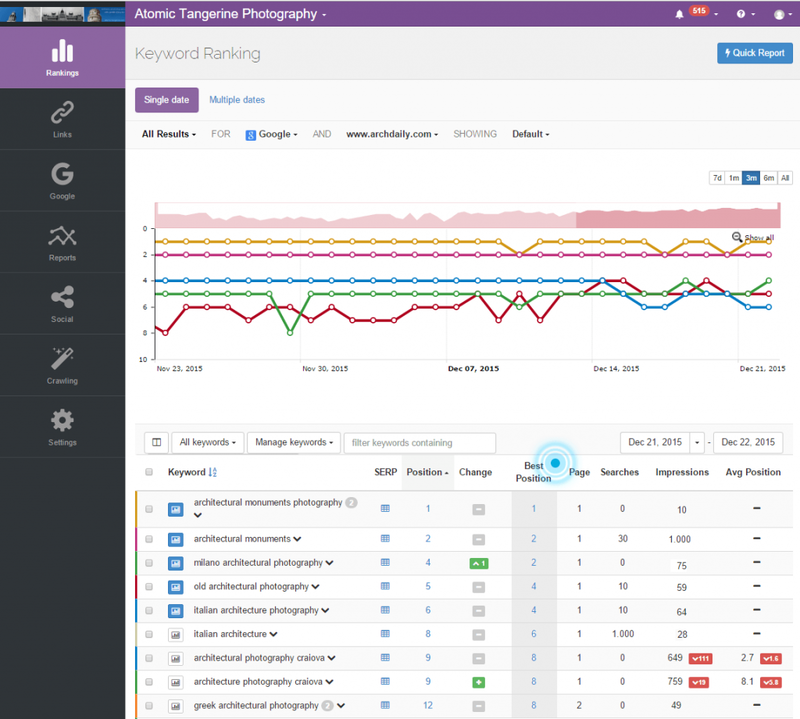 Afterwards, you can start tweaking for other keywords too, and monitor new ones closely. So, what do you think of these new features? Are they helpful for your current efforts, and how would you use them in particular? Is there anything else you would like to see in AWR Cloud? I’d love to see your comments on this! Great work on these recent updates. I especially find the Google Keywords section a really useful way of spotting opportunities quickly. The CTR curve is also interesting, it would be great if the chart was updated when you use the filter, currently it creates the curve based on all the keywords that are part of the project but it also doesn’t say over what period of time – it’d be interesting to see if seasonality or changes in SERPs cause different click habits. The CTR curve is computed over a period of 30 days. As I understand, you would like to compare the current CTR curve with a past CTR curve? This update and blog post are great. Please do posts like this for all of your updates! Hi Cristian, thanks for the post! Where does AWR get the “average CTR” value from? Does this value take into consideration the SERP (eg. how many ads Google are showing, one box visibility, etc). These all would effect CTR per position. Also mobile vs desktop as well. Would love to hear more details about this feature as it has lots of potential!